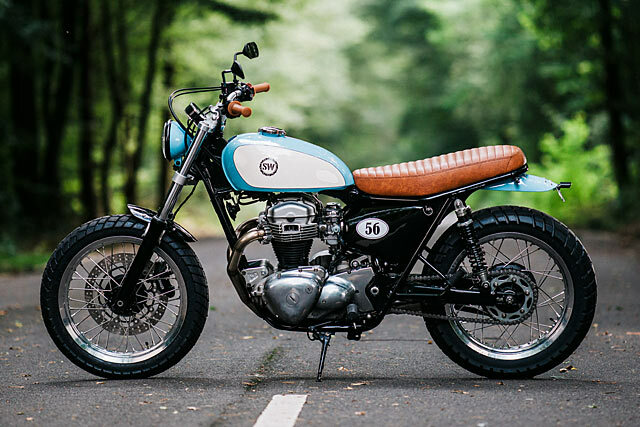 Think of your perfect desert island bike. For the purposes of the exercise let’s say that this island is blessed with amazing roads; roads that you have to ride indefinitely. 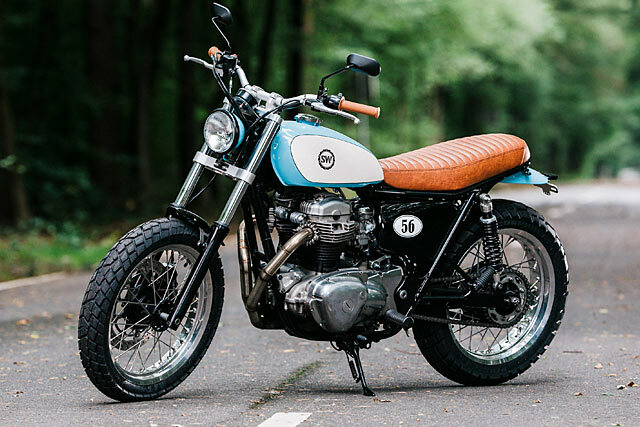 Suddenly all those dream rides like the Brough, Moto Guzzi V8 and the Britton look a little painful, yes? They’d be like having to share paradise with a megalomaniac millionaire or a narcissistic supermodel. You’d be better off with something that does a whole bunch of things really well, is super comfy and that will last the distance without breaking down on the first day. 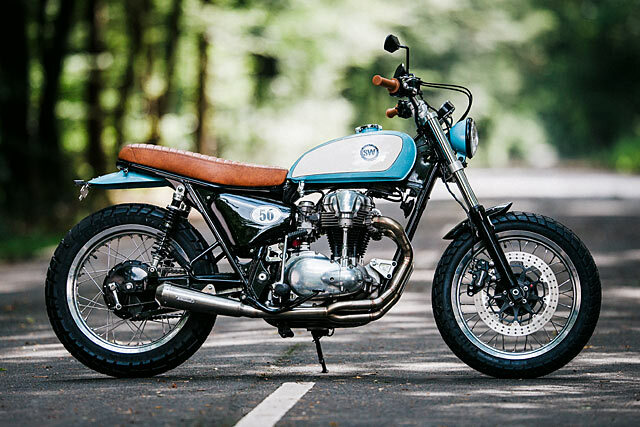 A bike a lot like the latest Kawasaki W650 from Germany’s Schlachtwerk. 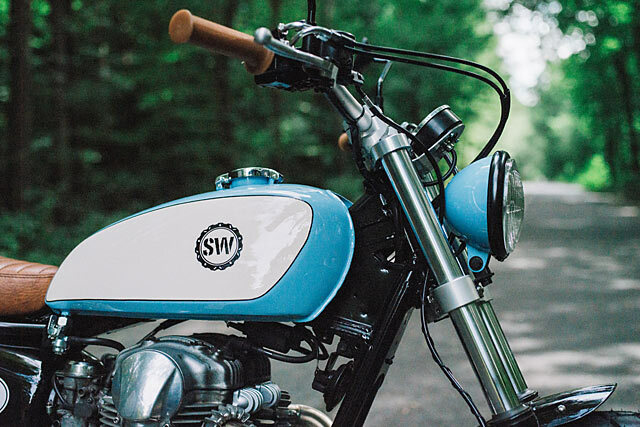 Inspired by Tommy’s personal ‘W740’ build, the soon-to-be-owner of this rather cool W650 placed an order. He made it clear to Tommy that there wasn’t a need to make it quite as extreme as the W740; he wanted it to be quick and agile, but clearly the weight and width extremes Tommy had gone to on his own wheels didn’t need to be replicated here. Instead, comfort and a little visual ‘wow’ were on the top of the list. According to the customer, it was the kind of bike he could live with forever. 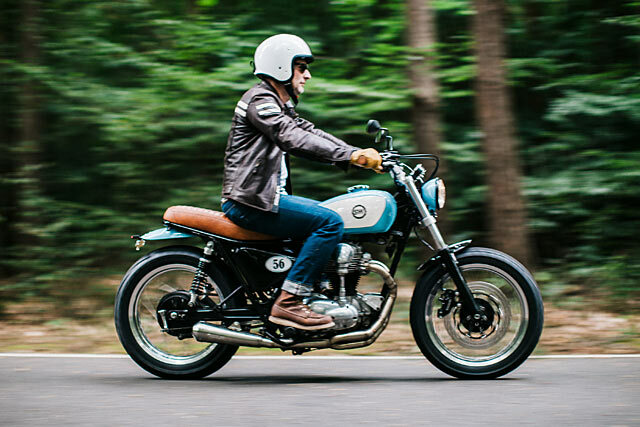 “The baby blue colour was inspired by the classic Gulf livery,” says Tommy. But before you roll your eyes and yell ‘overused!’ take another look. You’ll find that the finished look, with its dominant cream-white, makes it a little more creative homage than slavish copy and a little bit more vintage than Le Mans sporty. We like. “I found the bike in the Classifieds,” says Tommy. 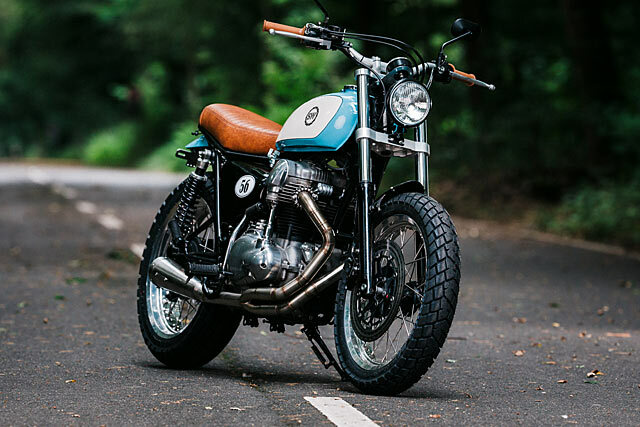 “It is becoming really hard to find a good donor W650 for customising these days; they are becoming very rare and quite expensive. Even more so for bikes with low mileage”. 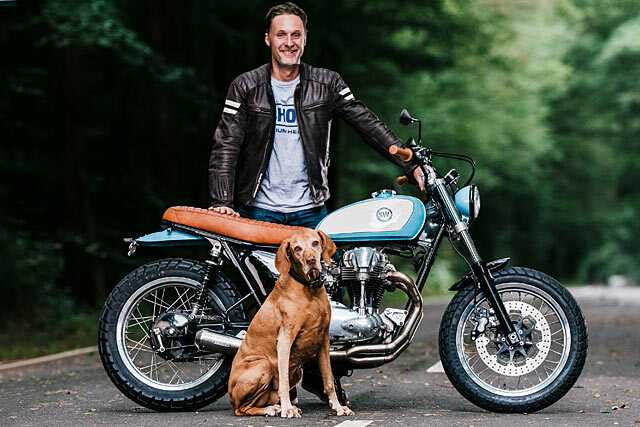 Believe it or not, German W650s are nearly the same price as the W800s. “We got lucky with this one,” smiles Tommy. “It had been well treated and it was in really nice condition”. After a thorough shedding of extraneous bits and bobs, the customer dropped by the shop and worked with Tommy to choose a new petrol tank and rim colour. “The tank is off a vintage Honda. I honestly don’t know which model, but it fits nicely and it looks great on the bike”. Spotted in a local Frankfurt market, Tommy had to modify it a bit, but says that it was less than he was expecting. Aftermarket parts included the triple trees and ’bars fom LSL and the Beringer brake caliper, while Tommy himself made the stainless exhaust and spoked in the new 2.5×18″ and 4.25×18″ rims with stainless items on the stock hubs. “The forks were then overhauled and equipped with new progressive springs. Two new YSS shocks were also added at the rear. The carbs were cleaned, rejetted and are now sucking through new K&N filters, purportedly adding 5hp to the bottom line. The wiring was simplified and connected to a new lightweight battery, relays, flashers, taillight and a headlight. 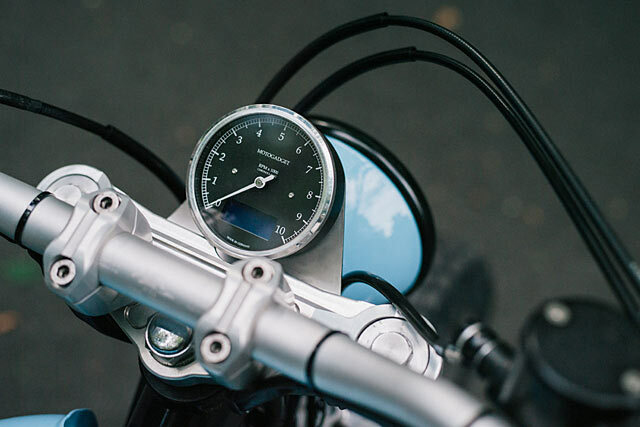 A Motogadget Chronoclassic Speedo was then mounted centrally in front of the upper triple tree. Carbon fibre fenders complete the list of new parts on the bike. 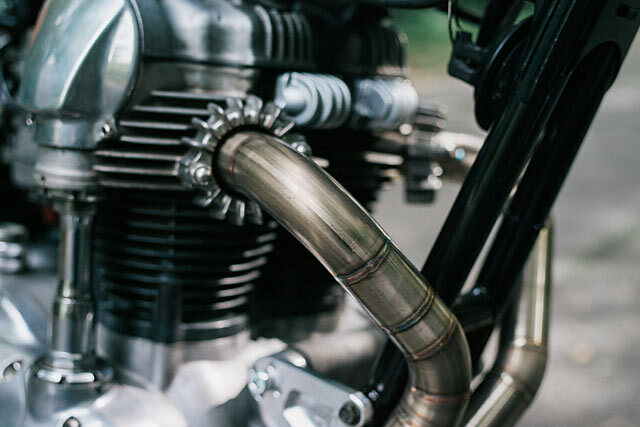 “The Kawasaki’s electric start was removed, along with all the related components to save weight and add some old-school. The Schlachtwerk engine brackets saving another 600g, giving the bike a total wet weight of 180kgs, 34kgs lighter than the factory original. The engine now puts out 58hp which is a good amount for a classic-looking bike”. The hardest part of the building process for Tommy was and always is the wiring. “To be honest, I don’t really like the electrical part of the bike building process. It’s not my favourite job,” he says grimacing. “It can be very complex and almost always frustrating”. 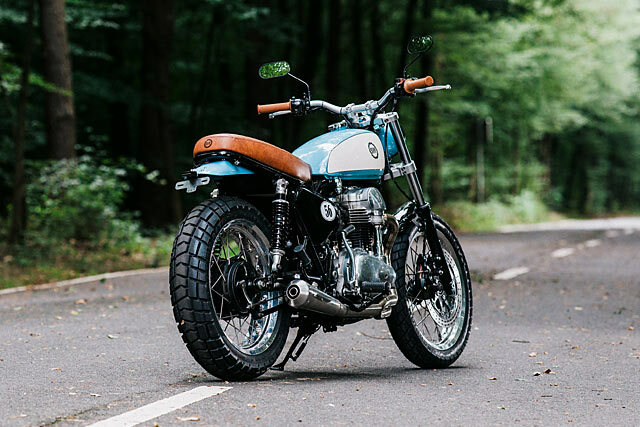 “I like the way a performance customised Kawasaki W feels. It’s agile. It’s reliable. You don’t need any tools for a trip. 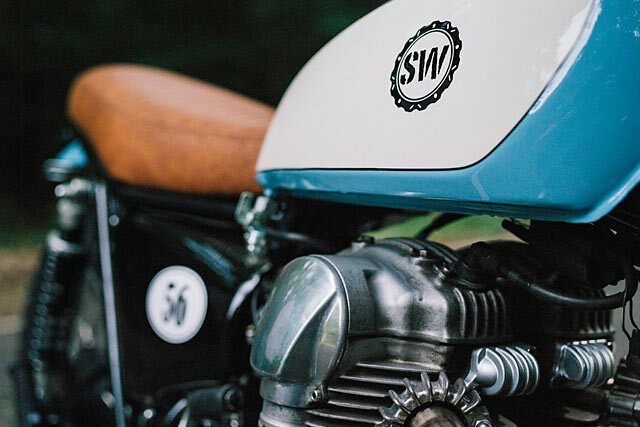 If a W650 is in need of tools, then you are probably in need of a good mechanic. You can use this bike for your daily trip to work and back, but you can also ride to the alps or wherever you like. This bike will be a partner in crime, whenever or wherever you need it”.